In Philippines, Easter is widely observed by the majority of Filipinos but not my family. Being Protestant Christians, my family doesn't have food traditions like other families do which is why I have no clue as to what they eat during Lent. At the resort, western and Thai holiday celebrations consist of dishes traditionally served during the season. On many occasions, I get the chance to work on some of them. This Easter, I was commissioned to make hot cross buns to mark the occasion. I didn't know what it was. I did a little reading to get some ideas for the recipe. What is hot cross bun? 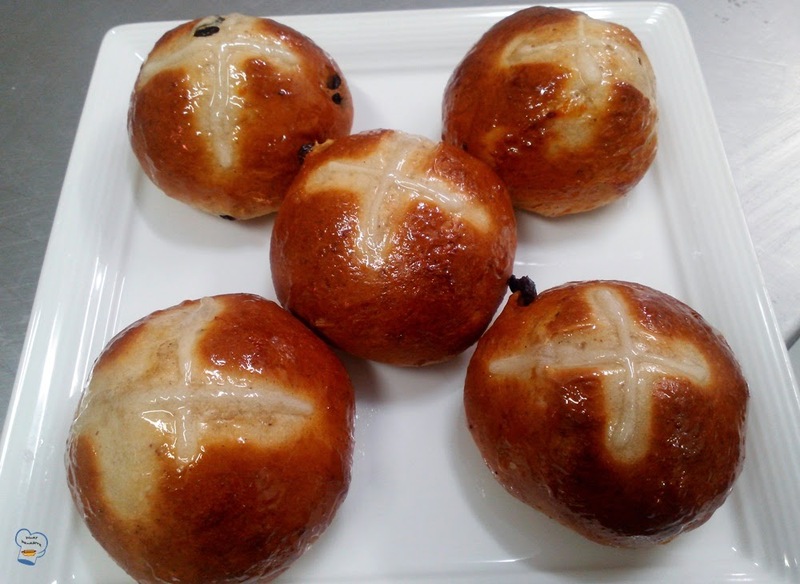 According to Wiki A hot cross bun is a spiced sweet bun made with currants or raisins and marked with a cross on the top, traditionally eaten on Good Friday in the United Kingdom, Ireland, Australia, New Zealand, South Africa, United States, India, and Canada, and now available all year round in some places. So there. The bun is an Easter tradition in most western countries. Another article states that they are served to commemorate the suffering of Jesus Christ on the cross. Prior to the big day, my boss requested I give the buns a go. I've never done it before so she wanted to see if I could pull it off. She gave me Jamie Oliver's version to follow. I didn't use the exact same ingredients as they were not available. Combine milk and water. Set aside. Stir in the eggs, melted butter and milk mixture. With a hook, knead the dough until soft and springy. Transfer dough into a clean flour dusted work surface. With your fist, knock the air out. Sprinkle over the dried fruit and mixed peel. Knead them into dough for a couple minutes. Preheat oven to 190 C. Grease and line baking sheet large enough to accommodate the buns. Divide dough into 12 equal pieces. Roll each into a ball. Evenly space the buns on the baking sheet so they can have room to double in size. Cover with the tea towel and leave to rise for half an hour or until doubled in size. Mix the plain flour and water into a thick paste. Place in a piping bag. Cut a cross on the top of each bun using a knife or kitchen shears. Pipe the paste on the cross. Bake the buns for 15- 20 minutes or until golden brown. Transfer to a wire rack. Brush the top with a little honey. You can either wait until it's cool before you eat it or slice it open while hot, spread butter on it and enjoy. I did the latter. The buns were a hit. The big boss gave me the green light to make big batch for Easter.